Foreign Minister Shah Mehmood Qureshi, Chief of Army Staff Gen Qamar Javed Bajwa and ISI chief Lt Gen Naveed Mukhtar were also present in the PM's meeting with the US delegation. Following the meeting, Pompeo and company left for India, where the US delegation is scheduled to hold a more elaborate round of talks. Addressing a press conference at the Foreign Office later in the day, FM Qureshi stressed that the "Pakistani perspective was presented responsibly to the US delegation". "You could have guessed by the body language that the meeting was a cordial one. We tried to understand their wishes and put forth our own expectations and concerns. "I told them that if you want to proceed with Pakistan, the foundation lies in trust, frank and candid conversation. And until and unless we address concerns from both the sides, progress is not possible. "I'm pleased to announce that Secretary Pompeo invited me to the US. When I will go to New York for the UN conference, I intend to engage with them [US officials] once more," the minister said. Regarding the US delegation's meeting with PM Khan, Qureshi said: "During the meeting at the PM House we all sat down and exchanged views. In the past, they used to come, meet the PM separately and then visit the GHQ. However, today's meeting sent a clear message that we are all on the same page." "Ice has been thawed," the foreign minister said. "Today we felt that we have created an atmosphere to reset our relations, and the lack of trust that was present has been broken which is a very positive development. "Believe me, if our narrative had not set in with them, the atmosphere would have been different, your questions to me would have been different and the nature of Pompeo’s tweet before leaving Pakistan would have been different. "I also told them, and they agreed, that there is no benefit of a 'he said, she said' narrative. It only ruins the climate of talks," the foreign minister said. Qureshi said that working together was in the best interest of both the countries. "We have been allies, and we have had tensions, but our history shows when we have worked together, it has been in the best interest of both countries. We did this when we worked together to decimate Al Qaeda. "Finger pointing will get us nowhere. The other way is to understand where the gaps are and where to bridge those gaps. I identified a lot of those gaps and presented it to them. Where our narratives are different on similar issues," the foreign minister maintained. "This wasn't a new decision," he said. "That decision was taken before this government took charge. I gave this matter some thought then I decided against raising it because free nations think along the lines of self-sufficiency. We will take a new direction." He also announced that his "first visit out of Pakistan will be to Afghanistan. "They are our neighbours; we are joined by geography, culture and tradition," he said. "Now we need to be each other’s support system and work together too. "If Pakistan progresses, it will be beneficial to Afghanistan as well and vice versa. As we progress in talks with them, we will keep you informed." 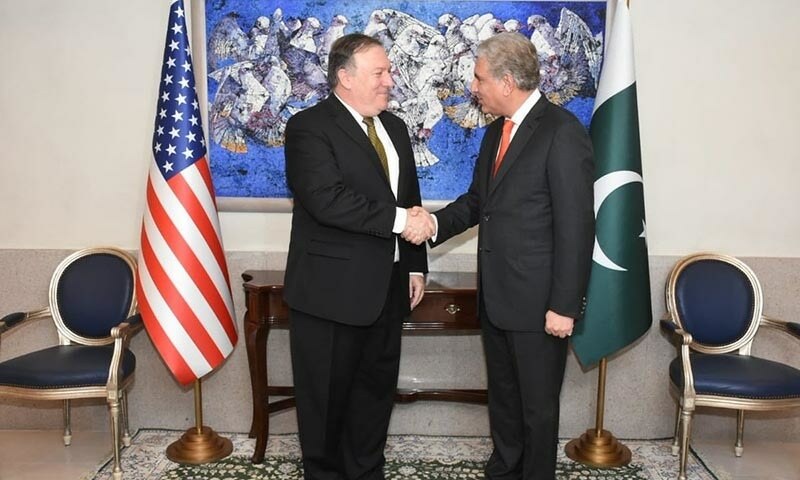 Before the meeting at the PM House, FM Qureshi had held the opening round of talks with the Pompeo-led US delegation at the Foreign Office in Islamabad, where the two sides had engaged for 40 minutes and discussed "bilateral, regional and international issues". "FM Qureshi underscores the need to reset bilateral ties on basis of mutual trust and respect," FO spokesperson Dr Muhammad Faisal stated on Twitter, adding: "Safeguarding Pakistan’s national interests will remain supreme priority." The secretary of state's plane had landed at the Nur Khan Airbase where he was received by foreign ministry's Director General (Americas) Dr Zafar Iqbal and American diplomats. Earlier, while talking to media representatives on board his Pakistan-bound flight, Pompeo had said he was visiting Pakistan to reset bilateral relations. “First stop Pakistan; a new leader there. I wanted to get out there at the beginning of his [Khan's] time in an effort to reset the relationship between the two countries," he said in his opening statement. “We have worked closely with the Pakistanis in my role as CIA [Central Intelligence Agency] director. Our teams have been working together for a long time. There are lots of challenges between our two nations for sure, but we’re hopeful that with the new leadership, we can find common ground and begin to work on some of our shared problems together,” he added. Pompeo said the new Pakistani government has expressed good-faith intention to improve bilateral ties. He said he was going to Islamabad with the US military chief Gen Joseph Dunford to have discussions with Pakistani authorities. 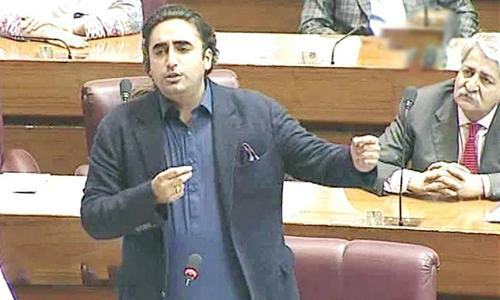 “We’ll also meet with General Bajwa, who we both know, who I’ve met with a number of times, as well as my counterpart, Foreign Minister [Shah Mehmood] Qureshi,” he said. “So we’ll have three opportunities to walk through the complexity that is this relationship and hopefully begin to make some progress so that we can get back to a set of common understandings,” said Pompeo while referring to a possible meeting with Prime Minister Imran Khan. “So, that’s really the very straightforward objective. I think it’s important to meet the new prime minister, Prime Minister Khan, early on in his time in office,” he said. A journalist reminded the Secretary of State that his trip comes right after the announcement that the US was cutting $300 million in military aid to Pakistan. “What do you think of that as a start-off point for this new relationship that you’re trying to build?” Pompeo was asked. “Look, this wasn’t news to the Pakistanis. It made a lot of headlines over the last few days ... but they were told this past summer that they weren’t likely to get that money,” Pompeo recalled. Pompeo said the very reason for this trip was to try and articulate what the US expectation was, what Pakistan could do and the things that they expect the US to do. “And see if we can’t find a path forward together,” he added. The secretary noted that most of the developments affecting Pak-US relations took place long before Khan was in power. “I’m hoping we can turn the page and begin to make progress. But there are real expectations,” he said. Pompeo pointed out that both the outgoing and incoming commanders of US forces in Afghanistan had said that this was not possible without Pakistan’s assistance. He acknowledged that Pakistan too had important interests, including security interests, in Afghanistan to “make sure they get the issues at their border right, and we need their help”. 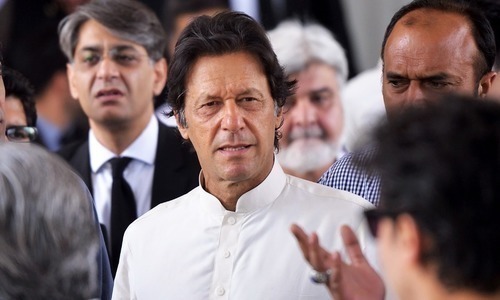 He said he was hopeful he could convince the new Pakistani government to provide that assistance because in a recent conversation with him, Prime Minister Khan had acknowledged that peace in Afghanistan was a priority for him as well. “I think he said they’re the number one or number two advocate for reconciliation in Afghanistan. I said I think we’re number three – all of us wanting that. So we have a shared goal there. I hope we can find a way to achieve it together,” Pompeo said. He said the US was providing different sets of resources to Pakistan when it made sense for the United States to do so because the partnership was in a place that both countries were coordinating their actions. “If that arises again, I am confident we will present to the President [Trump] the rationale for that, and then something like that might make sense,” he added. Responding to another question about whether he will raise the issue of Dr Shakeel Afridi during his trip to Pakistan, Pompeo said: "I have a long history of raising the case of Dr Afridi as the CIA director. I’ll leave it at that." Pompeo confirmed that Ambassador Zalmay Khalilzad was with him on the plane and that he was going to join the State Department team to assist him with the reconciliation effort. "So, he will come on and be the State Department’s lead person in the reconciliation talks," he said. Additional information from news agencies. Never ever trust these Yanks.!! Both sides should work earnestly to improve this all-important relationship. Every other country is distancing from USA, Pakistan would be fool if it tried to have closer links. united states & israel cannot see pakistan growing stronger. Read between the lines... " better start cooperating otherwise no money". America want to go back from Afghanistan respectfully, the only purpose of this visit of pompeo is. You back off from paying what you owe to Pakistan .That’s sure is a rude way to ask for help. Pompeo is useless tool, he will say something, do nothing, and move onto next flight !!! Please leave Afghanistan, invaders are not welcome and American forces are restricted to their barracks. This would be a good start, trillions of dollars wasted by US war mongers, they never learn, it's another Vietnam. Night time Russian military plane landing in Northern Afghanistan were not their for parties, they are giving arms to Afghan like what America did to the soviets. Long live the Afghan resistance against the foreign occupying forces. Relations can improve upon U.S becoming realistic and rationale. Pakistan should know he is made many racist / bigoted comments about Muslims in the past. Keep your $300 million in CSF reimbursements. Pakistan will do what's best for herself and the region. USA please do us a favor, let us be. You have no place in our bright future. It is not in the interest of US for Pakistan to become internally stable, with stable growing economy and on path to progress, it has never been and never will be. Past history of transectional relationship makes it self evident. When thery need Pakistan, they throw money with conditions, when they don't then it is sanctions time. They wan't Pakistan to remain weak and dependent so that it can be forced in to complaince with transectional relationship. Past Pakistani rulers made sure Pakistan remains weak and indebted in compliance with US wishes. Ik and his Government has rocked US boat, he will defend national intrest all cost by hook or crook. One of the most stupid explanations I have heard,all his explanations could have been countered easily. But Might is Right policy supersedes all. In every matter, Sub se pahele Pakistan. Team America - get lost! Leave us be! this is the real test for New Government. Can't live with them and can't live without them. let see what is the 3rd option. America is almost defeated in Afghanistan and try to diverted his defeat to Pakistan and wanted to safe way out of Afghanistan. We should not accept any threat and demands and assurance given to them to work together on equal level and also reject any aid/assistance they offered to us. @WARRIs And Pakistan is equally a partner in it, Remember who provided, land and airspace and other logistics. @ Raja Farhat Abbas : fine do not trust them. But remember they are your largest export market. China is not even in the top 5. if you do not trust your customer and work with him, your economic future is unsure. Nothing will be accomplished with Ambassador Khalilzad their. If the US goes along with Indian hegemony over its neighbours , it will backfire, they are naive if they think Pakistan will go along. There is a new spirit in the nation, Pakistan is no longer a proxy for the US in Afghanistan. US should not listen to Indian broken records of anti Pakistan to make decisions on Pakistan. India itself depends on other countries including US. International relations are never static but always dynamic. The present frost in relations is basically due to the fact that the previous Govt did not have a full time Foeigm minister. The ex PM held on to portfolio almost until the end when a completely in experienced minister took overfor a short while. Now we have a dynamic, experienced Foreign minister who will be able to present Pakistan 's case forcibly and effectively. The US team has come for a short visit on the " get to know basis". It is a case of frank discussions and not of concessions from either side. Let us get rid of trust deficit from both the sides. We indians have a positive feeling that under able leadership of IK pakistan and nodiji india will see thaw in ice very soon .lets pledge not to allow west to take advantege and together tell them loud and clear to bug off from south asia . we are capable on own to progress ta ta and bye bye ! Lots of big talk by the Secretary. Hopefully will translate to something workable. However, both parties would need to make major concessions in order to break this stalemate. Welcome to Pakistan. Now let us find common grounds. @GKA "But remember they are your largest export market. " They are not our largest export market, US businessman have installed some of their manufacturing facilities in Pakistan. The profit goes back to US economy. It cannot be called Pakistani export. They can shift these facilities any time anywhere. American Media is already breaking news "Pompeo will be tough on Terrorism Talks". Dictatorship attitude will soon end here with new Goverment. This testing the water. The tone later will define theacjievment of objectives. Recent article in Dawn : USA owes money to PK for service rendered: payment time before any further action; Kashmir has human rights abuses where is USA stand ; USA has no leavers to pull since no civilian, military aids or reimbursement: why Pk to listen or do : and I am not sure but soon will know if Asad Umer will go to IMF or not : Re advance aircraft PK has China and Russian to buy from and Helicopter from Turkey: re market in USA it is not going to make any dent: Folks have you noticed FM or General were not their to receive at airport: and perhaps PM will not meet: all talks be done by FM and General only! He bring up only lips service. I am sure Mr Khan and Mr Qureshi will reply the same way if is not worse. He is coming to Islamabad its not the others way around. Foreign troops in Afghanistan the major obstacle to peace. As soon is the foreigner go their will be peace horizon on Kabul. Now is the time to keep America at arms length. Best policy would be to improve relations with neighbours, especially India. Then reach out to more developed countries. Pompeo was received by DG (Americas) - this shows that this time the Pakistan side will look them into the eyes and talk serious business. A bery big wrong choice. Thats why the US policy has failed from the outset. Bring on board people who have good interaction with Pakistan, not the ones who have been anti pakistan. Pakistan should raise the issue of brutality of india in IOK and the Kashmir conflict resolution. US cant sit on the fence any more. Pakistan must not kneel before any US pressure of any kind! Afghanistan you're problem. You sort it. @WARRIs Agree, they (America) should clean their own mess. Surprise to know, so called super power who relies on Pakistan assistance to honour exist from Afghanistan?. The truth of the matter is their strategy in Afghanistan is not working and America wants to drage pakistan in its mess. Pakistan should avoid interfering within Afghanistan and only be part of the solution. As an Indian I'm ready to trust the Pakistanis but not these opportunist Yanks! After using and fooling Pakistan for decades now they are humiliating them. The same could happen with India as well. India, Pakistan and China should focus among themselves to build a solid relationship and better keep the Yanks away from the sub-continent. Why meeting PM? He is neither PM nor the President of USA. He should meet his level people in our country. Never ever trust the Americans. They have turned Kabul into the most anti-Pakistani government on earth: with full planning. IK govemrent has maintained solid and sobar pose on US officials arrival. In new Pakistan,every step ought to be taken on mutual respect and trust. secondly, IK should end separate meeting culture of differenth political leaders with our arm forces,which apparently gives negative message of having two powers in one country. Once again mark my words, America is not planning to get out of Afghanistan, America is in Afghanistan for long term, a real long term where it can surveillance Pakistan's nuclear capability and possibly destroy them when the opportunity presents itself, as well as it needs to counter, China, Russia, Iran, Pakistan and central Asian states, and hamper any economic developments and cooperation among these countries of the region. Afghanistan is centrally located to physically connect all these countries together. In this situation Russia, China, Pakistan and Iran will be fool if they d not support Taliban, and it will be interesting to see how American policy will succeed in the presence of these countries they do not want to see America stays long in Afghanistan. The Americans will never vacate Afganistan because of their nefarious geopolitical designs with China to the east and Iran to the west! And they need Pakistan for access to Afganistan and they can leverage us due to our weak economic position and they don't want us to get out this rut either with the help of India! Imran Khan is NOT Nawaz Sharif. They will not be able to bully Imran Khan. Pakistan should end ties with the American enemy for good. Respect begets respect. Hopefully Pompeo goes back with more than he had bargained for and Pakistan gets what is due. Did both of them came on separate dedicated planes ? US citizens should also call for austerity. Just saw on TV the meeting between the two Foreign ministers ended in 40 minutes. Imran will be. NO ONE can bully him. As long as the dangerous, diabolic, racist, bigot and biased Donald Trump and his cunning, criminal and crooked cronies are at the helm in the White House, Washington, D.C., nothing is going to change vis-a-vis the policies, procedures and practices pertaining to the fertile land and 225 million brave, bold and beautiful people of the Islamic Republic of Pakistan. America lives on its EXPORTS as well. It never is a 'ONE-WAY' street. The US and Pakistan have been talking at all levels for years but unable to reconcile any differences, even when governments have changed on both sides. How these talks can be any different remains a mystery. @Nit there is no money already. US doesn't enjoy the same leverage it did a few years back. All the emphasis was on "their expectations". Pakistan should stand its ground. @WARRIs If Pakistan believes that US has made a mess, they should noT have taken billions of dollars each year as aid. @Nit - Read between the lines - no money? then stay stuck in Afghanistan. Remember, it's the Americans who came to Pak for help, not the other way round. Now ask India no free ride any more and do more by sending troops there to fight against Taliban. Nothing much change on the ground without forceful diplomacy. As a matter of fact, from long time, US is continuously working to harm the interests of Pakistan. Either it is inclusion of Pakistan in Financial gray list or sanctions of Pakistani companies, US is always backing these steps. We do not need improve ties with US, what we need is independence of Pakistan's strategic interests from US influence. First of all, move all our foreign reserves from USD to Gold, Yuan and Euro. I'd be surprised if anyone could have a "discussion" on such wide range of issues in 40 minutes. More like they might have only exchanged already prepared briefs. International issues discussed !!! Is Pakistan in such a position today with her chronic economical situation? Let's hope these talks produce tangible results and are based upon mutual respect, interest and peace in the region! @Mir how can you betheir equals when you depend on their aid and their good will to get more loans? Pakistan starting point in the discussions should be " we do not want money from USA Period. and then the discussions should be started.Only then the discussions will be meaningfull. What is this everybody is speaking about $300 million. To hell with this money. Yes, any services US needs from our soil, we should give them our unit rates for the same , based on monthly payments. This is a deal.Period. Pakistan should maintain good relations with US but must take the advantage of changing in global politics, while Russia and china are shaking its unipolarity. @ Raja Farhat Abbas As if they trust you. 40 minutes with the FM, that's it ? That's not even enough just to go over the list of outstanding issues. @ Raja Farhat Abbas So it was easy to trust the Americans when the money was flowing in and now that the money has stopped, the trust is gone? Pakistan should sincerely work to have a Pakistan-first relationship with USA - this is the strategy US always uses (to safeguards its own interests). Push forward relationship with trade, science, technology, health and agriculture. The more deep capitalist ties we have with USA (hopefully benefiting Pak businesses and economy), that is the only way we can move forward with them. While it is in the interest of Pakistan to have peace in Afghanistan. However, it is India that wants continued unstable Afghanistan for India to exploit the situation and milk the United States for technology, trade preference and top of the line weapons at a cut rate. On the other hand, Pakistan must remind the United States, if they want Pakistan to help them, so they can get out of Afghanistan with dignity, than they must also help Pakistan solve KASHMIR ISSUE once and for ever. @Pakistan First Its surprising how the trust is gone when the money has stopped flowing in. Underscoring need to reset bilateral ties between the two countries, whom are you trying to be fool, Mr. Pompeo? Gaining time with a plan to strike Pakistan when you are ready for the action and they are ill prepared appears to be your job this trip. You are not going to be fool the Pakistan government and its people by your gestures. Discussions on bilateral, regional and international issues lasted just for 40 minutes, says everything. I think USA has to do more or nothing more and leave Afghanistan. Pakistan comes first. Any deal that does not benefit Pakistan and its people is a bad deal. Pakistan is not their to please foreign countries by damaging its national interest. Any activity from Afghanistan should not cause problem for Pakistan. USA should help the countries in the region and compensate the losses that they have inflicted upon poor people of Afghanistan and Pakistan. The mutual trust has deteriorated over many passing years with the United States due to poor diplomatic behavior from United States mostly favoring India.Everytime US in the recent past addressed the South ASIAN issues showed their tilt towards India,&thus favoring India in all its efforts to discreditPAKISTAN. Afghanistan is the US quagmire that can only be solved by PAKISTAN&PAKISTAN alone.Blame game has been going on against PAKISTAN for more than 10 years.This situation has eroded PAKISTAN&US relationships&is not going to improve until&unless US changes it’s approach towards PAKISTAN. The Pompeo&Qureshi talks can bring back the harmony as soon as Prime Minister Imran Khan&Pompeo,General Dunford, and Pakistan Army Chief Bajwa meet&are on the same page of revitalizing US&Pakistan relationships. Enough of Arms Twisting of Pakistan by US&it’s demands from Pakistan to“Do more,”against war on terrorism.The US can play vital role for mutual improvement of relationships with Pakistan. Message is very clear: talks will only be held on mutual respect, interest and what is good for Pakistan. This is the long due change that public wanted - well done PTI. There are always two faces in foreign policies and relations. One public to satisfy the masses who you need vote from and one private in which the real issues are discussed and resolved based on state interests achieved through a process of wheeling and dealing in closed rooms. Both Pakistan and US have been practicing same policies towards each other now for many years irrespective of who has been in the top affairs of running the governments on either side. Pakistan should demand that USA should condemn the atrocities committed by the Indian government in Kashmir. USA should come out 100% for the Self determination for the citizens of Kashmir. America is even more polarized with Trump as the President. Amazing what they think and how much destruction they are capable of, that should be our worry, the 300 million dollars, does not mean anything, if you compare it with Syria, Afghanistan, Iraq, just stay safe with these trigger happy cowboys. They wish to stay in control, and the cost, the poor people have to bear with their lives. Pakistan should act with maturity and handle the situation tactfully keeping in view the national interest. @saudagar(indian) Thank you for your thoughts. Hope leaders of your government think the same. @Vishal That's why key issue of Kashmir needs urgent resolution but Modi has not got the plot. So no mention of $300m? If the money was for CSF, Why doesnt the govt go to ICJ or UN to claim?? Surely there is proof? Or is it just talk..like other things. No Press conference? Doesn't sound good. @Jalil yousaf Trump and IK are like dollars and Pak rupee. Don't be silly. Yankees interested in Asia again..
@PAKISTANFIRST "Pakistan should sincerely work to have a Pakistan-first relationship with USA - this is the strategy US always uses (to safeguards its own interests). Push forward relationship with trade, science, technology, health and agriculture. The more deep capitalist ties we have with USA (hopefully benefiting Pak businesses and economy), that is the only way we can move forward with them." Good and positive point. Those are the things Pak should concentrate and strengthen economy,for the betterment of the citizens of the country. @Mubashir Munir Make sure you keep repeating: "we should stand on our own feet.Never trust America" "we should stand on our own feet.Never trust America" "we should stand on our own feet.Never trust America"
What a disgrace! IK met Pempeo against all the expert advise given here by the PTI supporters. Where is the "Do More" list? Throw Khalilzad AfghanAmerican the darling of US ultra-right in this dialogue, don't expect anything positive in the favour of Pakistan. @FIDA SAYANI unfortunately he didn't. @ Raja Farhat Abbas these Yankees that’s what they are called and another name is red neck. Can't say what is the final outcome of this meeting but one thing for sure. new PM was n't speaking from his notes. Ambassador Zalmay Khalilzad is the least trusted person in AF-Pak circles and has no respect to do that job. Please do not waste your time with used ammo. I have been living in USA since 1980 and what I learned here is as long as they need you in their self interest they will do what ever is needed. Instead of pleasing you if they could walk over you, they will walk over you. It is pure business with no emotions! I trust Russians more than Americans! No one can trust statements from US government as long as Trump is in power. @saudagar(indian) I totally agree with you. But, it wont happen. It is not in interest of USA and China for India and Pakistan to come close and grow stronger. Even though we have more in common than these 2 countries! WE need to act smart! @Neo I agree. It is common sense to have a good relationship with India. There is no other way, India also need to respect us only then it can happen! PM of Pakistan is now symbol of pride. IK dealt the delegation with grace and respect. It is time to rise Pakistan. In my opinion Imran Khan is not fully matured yet in diplomatic norms to solve problems with international community. I thought PM House will be converted into a University. What happened to those promises by the PM? These are early days. More of optics than substance. Both sides are trying to get feel of the other. Don't jump your expectations. Allow the process to settle. Real hurdle is india not Afghanistan. The meeting can be summarized in three words - "Do more Pakistan"
Pompeo was expecting things to be as usual with him meeting the Army chief on the side. That didn't happen. That is a first for Pakistan. Americans should know who they are talking to. At last a good, matured and more practical sense is prevailing in our leaders! USA is arrogant and as long as they are it is hard to have bilateral commutations based on principles of equality or win-win talks ever! I understand they are a superpower for now, however, this does not mean they always have a right to dictate others! @Zak The plot is we will never get Kashmir, even if fifth war is needed to be fought! Was the dollars three hundred millions an aid or was it meant to compensate us for services rendered to the U.S. and Nato forces in Afghanistan? The benevolence shown by our foreign minister by not bringing this issue with the American secretary of state speaks volumes about the naive behaviour adopted by him. His explanations of the event on the tv press conference just goes to show his immaturity in dealing with the Americans. That he was trying to please the Americans was evident to all and sundry. It is very early to comment on this visit. Just wait. More like - Do something! 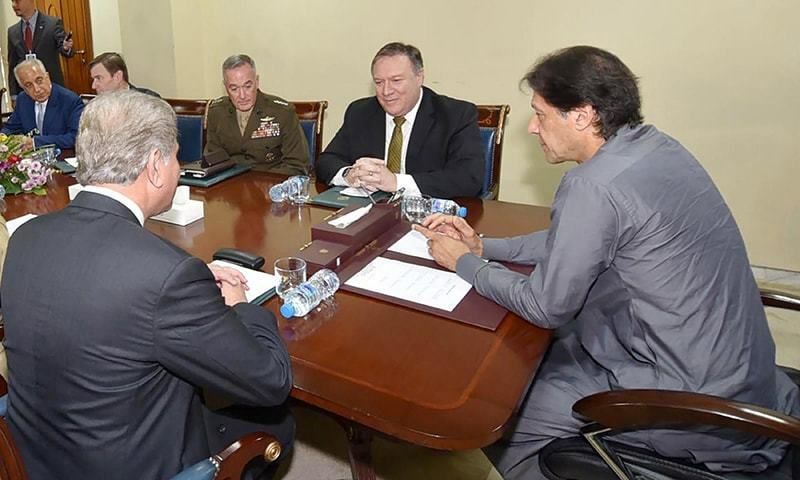 In the main photo, it is reassuring that Imran khan is sitting in the chairman poisition and Pompeo on the side of the table like other ordinary members. Good show of authority to and leadership by IK. Let us wait for US statement on their meetings in Pakistan and also watch their interaction with Indians. Remember the decision to hold the money was not to punish Pakistan but rather appease India, which is their next and main trip. 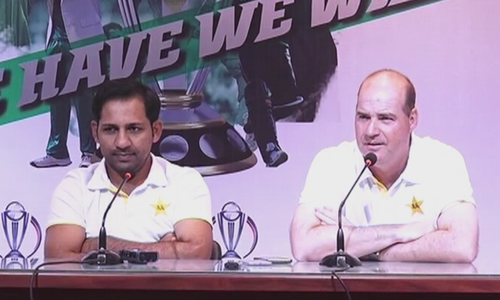 Also good job by Pakistan for playing it cool. Its sad PTI hasn't revealed what actually they have spoken. At least some points would be nice instead of stating, resetting, bilateral....nonsense..
Zalmay Khalilzad is the most anti-Pakistan person in the room. It is a mistake to give him any major role in any reconciliation. America is unlikely to achieve much because of his limited vision and negative attitude. @Nusrat agree even Canada, Mexico and UK is distancing itself from US. Our FM Qureshi was trying hard to say nothing! Not heard too much from Pompoe? The crux of the matter is, "I am confident we will present to the President [Trump] the rationale for that, and then something like that might make sense". But, he have very solid proofs from various issue that, nothing makes sense from, or to the President (Trump). All this is talk and if we read between the lines, we can see that nothing really substantial has happened. The same old stuff has been discussed as always. I would not be surprised if the USA again asserted their 'do more' demand and Pakistan once again trotted out the typical excuses. Let's wait and see the outcome. No substance from Pompeo's tweet, but a long self assumed talk from FM. What really happened in the meeting will come out later. Qureshi is again making a fool of us. Until a day ago, the $300 million was a reimbursement. Today it is aid, exactly as the Americans were describing it. "This wasn't a new decision," he said. "That decision was taken before this government took charge. I gave this matter some thought then I decided against raising it because free nations think along the lines of self-sufficiency. We will take a new direction." How can self-sufficiency come in for reimbursement? So while he wants US-Pakistan relations to be based on trust, he is playing tricks with his own people. How shameful. Love to the American people mostly didn't vote for Donald, that shows the loving nature of American, but no love to hate mafias any where in the world. We all live in this world and call it our home, Republicans stop starting wars. Hope they taught them enough and gave clear instructions. Why is always a Pakistani army guy present in all Pakistan PM's meeting. Qureshi's decision not to talk about 300 million dollar aid cut is very smart. Ignore this US did so to pressure and black mail Pakistan. 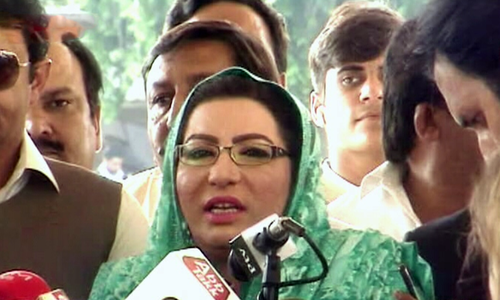 Press conference by Qureshi shows self appreciation, however, the real outcome of the meeting may be different. FM first reported few days ago that he will raise the issue of $300 million reimbursement with US officials. Today he says that he did not raise this issue because Pakistan wants to be self sufficient. This was not free money but reimbursement which US had agreed to to repay. How can we trust the other side who does not keep its promise. Mr. QURESHI has been over ruled but he does not admit it. This is a new Pakistan. Old wine in a new bottle. To me nothing has changed. I am not sure how can the foreign minister decide not to discuss CSF fund. It is Pakistani money as we already spent it and it was agreed upon. Who had decided not to bring it up before the government came, as he mentioned in his statement? The optics were good as the civilian and military leaders we in the meeting together but no concrete change in attitude was seen. We the people of Pakistan have seen many ups and down and not worried at all about our relations with US. Pakistan will rise because our people are talented, our land is fertile and we have tremendous natural resources. It was bad leadership that today we are faced with difficult situation but rest sure Pakistan will soon become a great economic power. Mark my words. Zalmay Khalilzad on the plane to Islamabad, big mistake. US does not know the culture and mindset. US keeps bringing India and Zalmay Khalilzad in its relations with Pakistan. Its a gigantic mistake. Nothing will come out of it. Paks carried themselves with responsibility, self respect, and diplomatic reserve. Ignoring the $300M bite was brilliant. Overall, a demonstration of confidence, sovereignty, negotiating excellence. America has had a history of supporting regimes that have killed millions of people around the globe. The only thing America cares about is the interests of the powerful corporations inside America. All America needs from Pakistan is to support their selfish intentions in Afghanistan, no matter how destructive it is for the people of Afghanistan or Pakistan. This has created a lot of resentment in Afghans for the Pakistanis. Unfortunately, American has mostly been able to ruin all poor countries who have not supported their agendas, but this can't go on forever. Pakistan should stand up to this bullying and having leaders who aren't thieves is a good start. self sufficiency supersedes everything ! Are you living in USA? @ Raja Farhat Abbas but do you still want their money? They should know and value Pakistan's expectations. It is not good the FM not discussed with him about $300M + $500M expenses which we did for them. It is not their money. It is Pakistan's money and we should not show any excuse. Zalami Khallilzad sitting at the table ....not a good sign. 'I decided against raising the $300m issue': Qureshi wise move, grapes are sour! The United States' refusal to reimburse Pakistan for the military expenditures incurred on behalf of the US should not come as a complete surprise, knowing the history of U.S - Pakistan relations. Pakistan should take it as a blessing in disguise. Perhaps the dawn of a new era in the relationship with the US. Let's make it an opportunity for Pakistan to break the shackles of economic and financial dependency. The nation can do it under the new patriotic leadership. @Fraz Ahmad you dont have foreign reserves. The Pakistanis still have alot to learn...they should have insisted on Pompeo visiting India first before Pakistan. Doesnt matter how sincere the Pakistanis are the geo politics has changed indefinitely. However, the fact that they didnt raise the £300 million aid cut is a good start to show Pakistan will learn how to struggle and survive. One meeting and all the rhetoric of Qureshi goes out of the window. "I told them that if you want to proceed with Pakistan, the foundation lies in trust, frank and candid conversation" Statement seems to please Pakistanis. Trust is created not told. @Nusrat While there is some truth in your statement, Pakistan's location is very important, the road to peace goes right thru Pakistan, no one can ignore it, no one can take it lightly. The world needs Pakistan's help, simply put. Its not like Pakistan doesn't hold any cards.Americans know very well they need Pakistan's assistance, but Trump is a different breed, he doesn't know first thing about diplomacy, the world issues, nor does he really listen to anyone, although he claims he does. Trump will soon find out that not everyone is willing to get bullied. US talk about Afghanistan why not about Kashmir andPalestine? From the body language looks that PM IK was fully ready to handle the situation, he calmly walked in showed courtesy to the visitors without going overboard. Mr. Qureshi, i was a big fan of PTI , you and IK. After this useless press conference and no joint press with Yankees, it is proved that nothing useful was discussed and you just bowed down to their requests and forgot about the blood of our Shaheeds. And keeping the people in dark about you yourself decided candidly the future of Pakistan, it is very disappointing press conference and your meeting. The gist of this meeting - Do more Pakistan! Mr. Qureshi, can you please explain. Today you say, self sufficient nations don't ask for money.Two days ago, you said it was not aid, it was our money due us for services rendered. So what is it ? Money owed to us has nothing to do do with how rich or poor we are. The richest of nations do NOT write off money owed them just because they are self sufficient. With Pakistan, US defeated the Soviets. Without Pakistan, US will lose in Afghanistan. Trump is sitting in the White House, but Islamabad holds the 'trump' card. Make sure US knows that. We always keep doors open. But no more humiliation, no more exploitation and no more dictation. Everything at par. Can anyone trust USA? NO Absolutely NOT. PM should not have held a meeting with Pmpeo. Qureshi is his counter part and meetings should have been done among those two. He should have been allowed to call in to PM and COAS. Pakistan must behave with self respect. If not then When?? What is different than Zardari or Shareef going to meetings with under secretary. Any body who trusted the USA got bitten by the USA. It is better to stay away from the snake. The only people the Americans care about beside themselves, is the Israelis and the Saudies, all the other countries are being bullied , threatened , coerced. America is up the creek without a paddle in Afghanistan, now it's looking to save face and to exit from the mess they have created, they will blame Pakistan for their failure. Pakistan should tell them where to go. Come on PTI, show us what you're made of. Imran establishes dignity and respect for Pakistan. Would you still support PLM-N and PPP who robed the country's wealth and disgraced the nation worldwide? The official transcript of the meeting issued by USA and what qureshi is saying about what was discussed in the meeting are completely different as if they are about different meetings. So the foreign minister has decided to misinform the people of Pakistan? Honorable PM wearing the National dress, not reading from papers and giving no undue complements to any dignitaries is what we expect from the PM. Making the Nation proud with these little things that count and means a lot as a nation. I trust my Captain 100%. The weak link is Qureshi who tried to sell us the Kerry-Lugar bill back in the days. I do not teust him as a Imran Khan supporter. Clash of personalitie's clothes.PM Imran Khan is wearing Shalwar-Kameez whereas FM Shah Mehmood Qureshi. is wearing a full suit.The question arises has PM Imran Khan given up wearing a full suit for good? As that the best you achieved to get invitation to US Mr SMQ? Mr Pompeo doesn't give up to his narrative to do more. they cut money for Palestine,they cut money for Pakistan(sacrifice made by Pakistan Army)why they come to talk whit us??? Good decision to become self sufficient! By not talking about $300 million, Pakistan has sent a clear message to USA, that this government is different from Zia, Sharif, Bhutto/Zardari and Musharaf governments in the past. America should talk to Pakistan on equal footing, because this government is peoples government. US despratly needs help from Pakistan in Afghanistan. They have no idea how to solve the issue. It is costing US 42 billion a year. Pakistan is in good position to be tough with Trump. Why did Imran Khan meet him? I don’t think that’s according to protocol. Qureshi should have met him. Borrower is always SLAVE to the lender. Great decision NOT to ask for AIDfrom USA and STAND own feet. What is 300 Million for nation of 200 million..
Did he meet General Baja. @Saleem For your information, they had to have come on two separate aircraft because Secretary Pompeo was to head to India for the 2 plus 2 talks and General Dumford was heading somewhere else. What was the outcome if any? Those commentators who talk against the USA don't understand that they can pull the rug from under us. Their body language is not very promising. Pakistan deserves a better man than SMQ as foreign minister. He conveys his own impressions as facts to his countrymen. Many examples other side contradicting his claims but he doesn’t seem to learn. Here is NAYA pakistan to see, the visitors were received by the foreign ministry's Director General (Americas) Dr Zafar Iqbal and American diplomats. PM of Pakistan dressed like common Pakistani is seen entering the room where the participants of meeting are waiting for his arrival. Thank you PM for maintaining the decorum of Premiership. Unlike the previous PMS, the new PM of Pakistan is NOT for sale. Why couldn't the present regime stand by the resolve NS gov't adopted. No more Pakistan involvement in Afghanistan. It was a bold decision and only Nawaz could take. What is American interest in Afghanistan? The term terror, terrorist is merely an excuse to keep their presence in there for ulterior motives. Had Nawaz accepted the US demand, he wouldn't have been in jail. That 'hope' will be manifested, when Trump is gone from the White House. @WARRIs IK could have been in more control with more visible leadership role if his chair height had been increased by around one feet . Good start... Pakistan needs to highlight its sacrifices to re-earn the global goodwill so badly tarnished by our age-old ally. The Bilateral talks are useless and will produce nothing till both parties have similar aims and goals and not just talking points of their positions. They are diametrically opposite. I would concentrate on where the two have agreements and make them stronger. Congratulations, Pakistan for having a better and productive meeting than India, with US delegation. That is Pakistan's master stroke! Imran Khan is wise enough to know these people cannot be trusted. Never take their word for what they say they always lie. Blackmail and deceit is a fundamental principle of American diplomacy.